Is your data on a native grid? A native grid is a model that was designed from the beginning with a particular map projection. In order to plot the data exactly as the designers planned, we do not want to transform the data to a projection, but simply plot it. This is the essence of the examples on this page. Just because your data has 2D lat/lon arrays, does not make it a native grid. 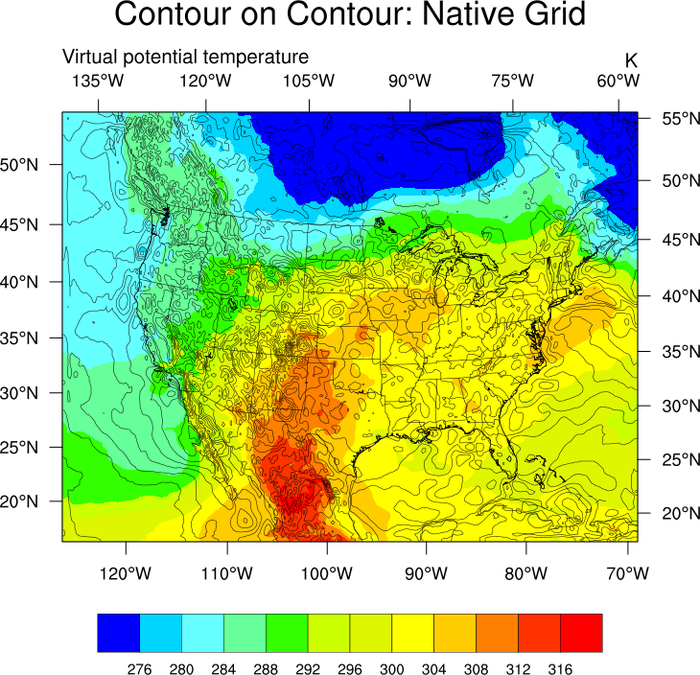 Native grids are plotted differently than other data with 2D coordinates. In all cases, you MUST use the mpLimitMode="Corners" method to specify the grid. Other methods will result in an incorrect mismatch between the data and the map. 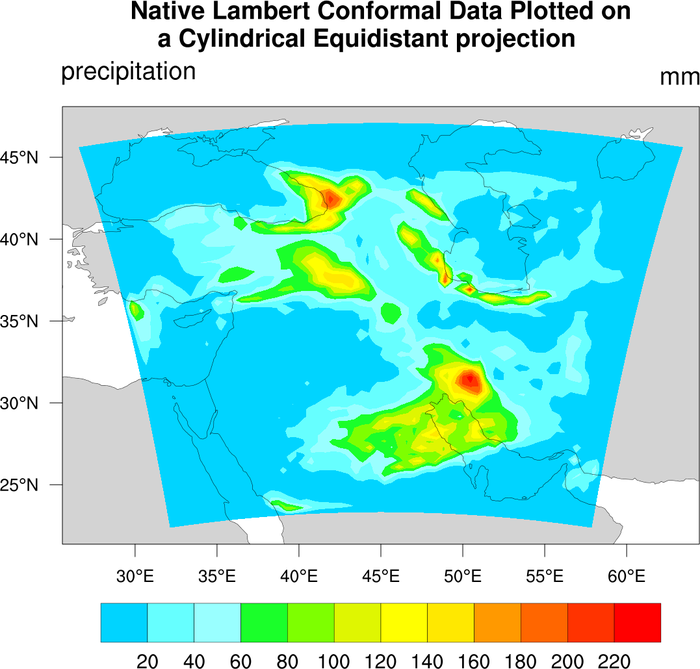 Additionally, you must set tfDoNDCOverlay = True so that the data is not transformed to the projection, but is simply placed there since it is already on a projection. pmTickMarkDisplayMode = "Always" turns on nicer tickmark labels. 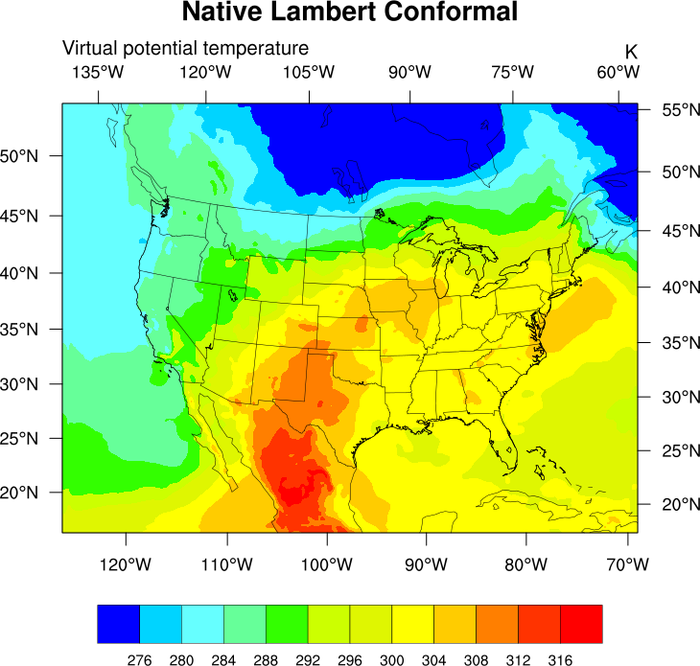 lcnative_1.ncl: An example of plotting netCDF data that is on a Lambert Conformal native grid. 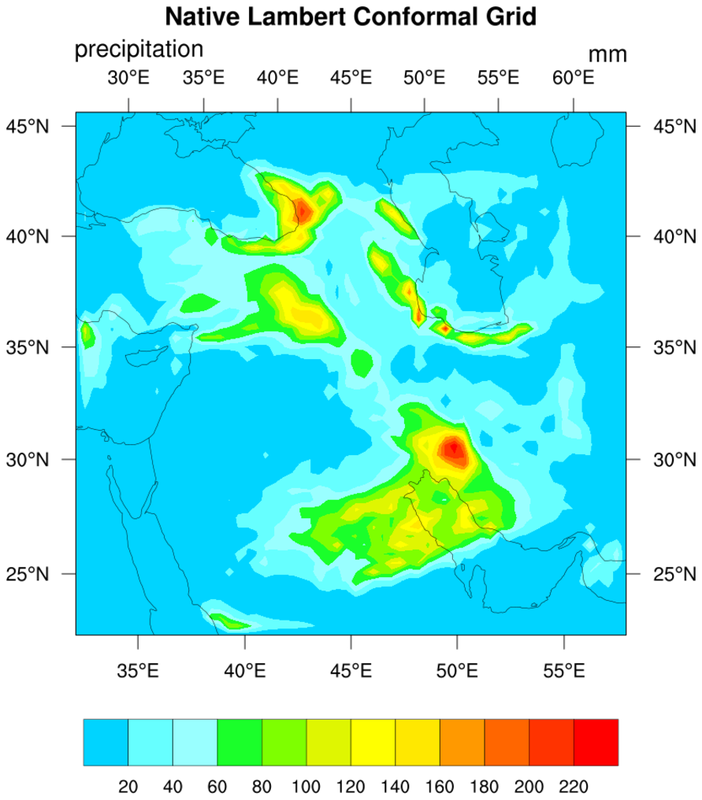 See the next section for an example of plotting this data on a cylindrical equidistant map projection. netCDF files may or may not contain the parallel information needed to plot the grid correctly. Grids on GRIB files (see example 4) contain this information. mpProjection = "LambertConformal", sets the projection. The problem with Lambert grids is they are are sometimes described by a meridian, parallel and a delta X and delta Y in meters at the intersection of the meridian and top parallel. It can be VERY difficult to come up with corner points when this method is used. 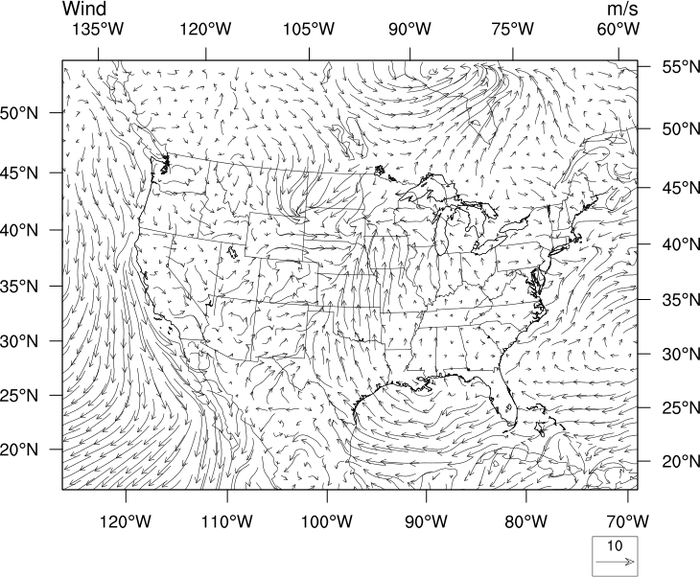 lcnative_latlon_1.ncl: This example plots the same data as the previous "lcnative_1.ncl" example, except it projects it onto the default cylindrical equidistant map projection. The special "lat2d" and "lon2d" attributes are attached to the data, so the plotting routine knows what the lat/lon values are. 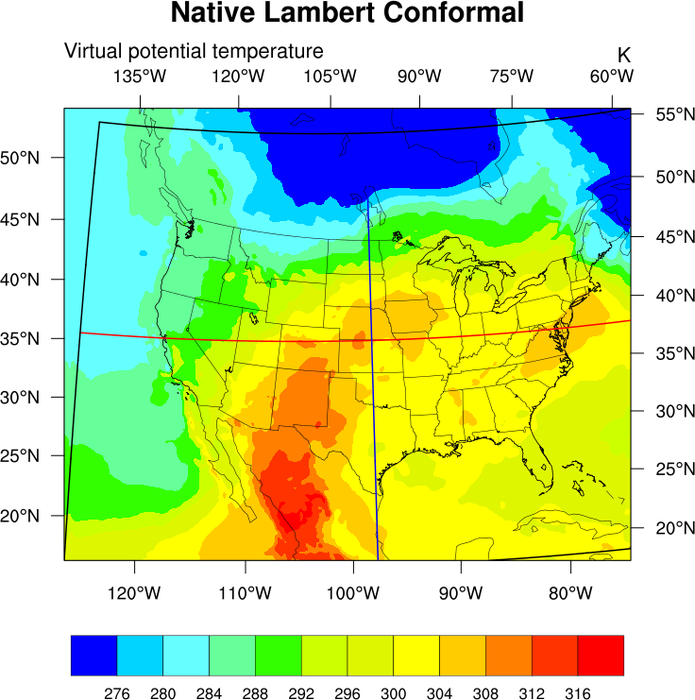 lcnative_2.ncl: Native lambert conformal grid from a GRIB file. GRIB files contain the parallel information, and NCL automatically reads these values in and assigns them as attributes to the lat2d array. lcnative_3.ncl: There are times when you may not know the appropriate parallels for your native lambert conformal grid. This examples demonstrates one way to find out. As a first guess, start with the parallels in the center of the grid. look at the lines plotted on the map (see below). You know the projection is correct when the red and blue lines form a right angle between themselves and the border. Iterate as necessary to get the closest solution. Your best bet of course is to get this info from the model itself. lcnative_5.ncl / lcnative_overlay_5.ncl: Vectors on a scalar field. This example shows two ways of overlaying vectors on a color scalar field. One way is to use the "all-in-one" function called gsn_csm_vector_scalar_map. 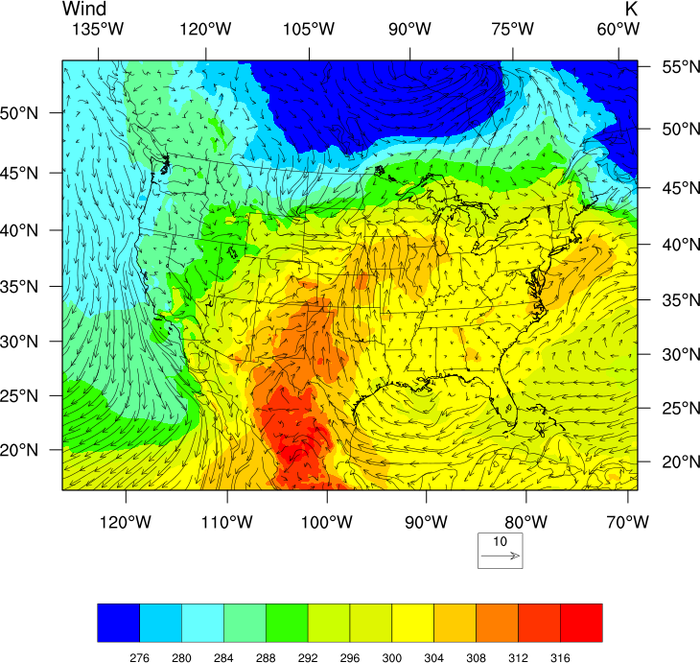 The second way is to create the vector and contour plots separately using gsn_csm_contour_map and gsn_csm_vector, and then overlay them with overlay. This second method is the recommended one, as it allows more control over individual plots.